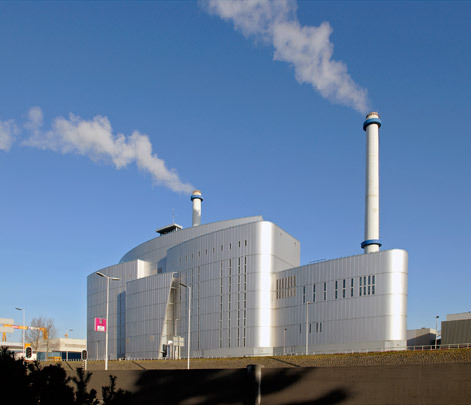 Ever stringent environmental regulations necessitated the construction at the end of the 1980s of a new plant for purifying flue gas from the city incinerators. The building terminates two urban axes with a flourish. Wrapped around the plant is a tight skin of silver-coloured steel sandwich panels with a dual purpose, to absorb the noise made by the machinery and to ward off wind and weather. The design of the building's curved walls successfully reconciles it with the surroundings, for all its great size. The walls themselves fuse in a dynamic totality that changes appearance with the sun's position in the sky.